Oh dear. 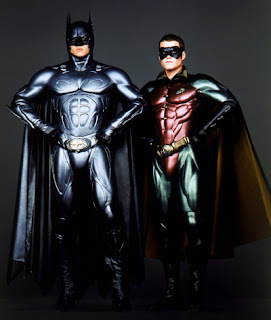 Trying to choose between this and "Batman and Robin" is like trying to choose between Hitler and Himmler. Warner Bros wanted to get away from the gothic oddness of Tim Burtons take and they got it in spades with a flashy, noisy, too bright, smug, self-indulgent mess that was the kiddie-friendly they wanted. But a pile of poo. Really, really can't type what irks me most. Aside from the self indulgent feel, we've got Bruce Wayne with a highlighted blow wave, a hideous Robin, a rubbish Two Face (Tommy Lee's nadir? ), a "i want to kill him now" Riddler, the list just goes on and on. Can't face going in to more detail than that. I've had a crap day and don't want to be more wound up than i am. Just take a look at the trailer here, and there's what's wrong right in front of you on the screen. Every. Bloody. Second.